At the risk of sounding like I'm a paid advertiser for Aidells sausage (I'm not), I am sharing another recipe (the third in less than a month) featuring their Roasted Garlic and Gruyère Sausage. I have just recently discovered this sausage, and I admit to being a great fan. At the end of December I featured it in a hearty green salad with roasted potatoes, hard cooked eggs and haricots verts. Then, I started the New Year with a pizza...with squash and apples...and the aforementioned sausage. 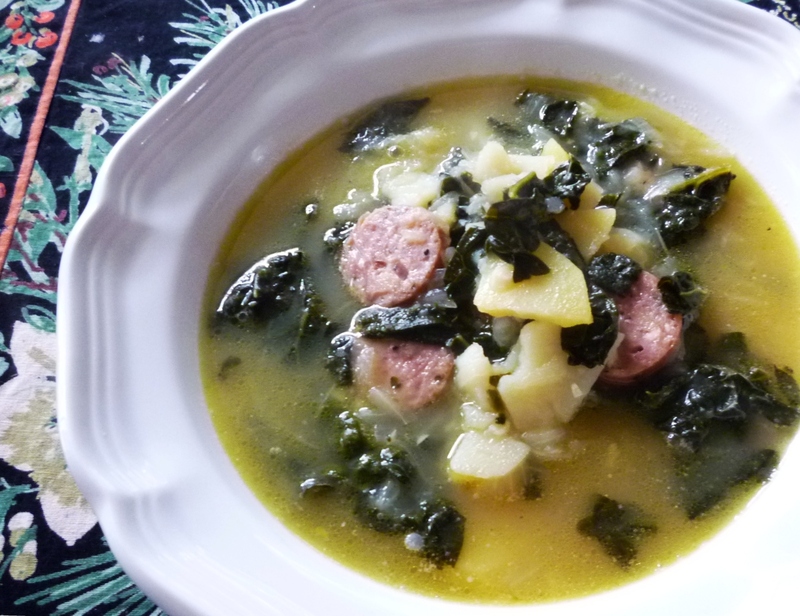 Today, I'm sharing a recipe for one of my favorite soups (Alice Waters' Kale & Potato Soup), made even better by the addition of said sausage. 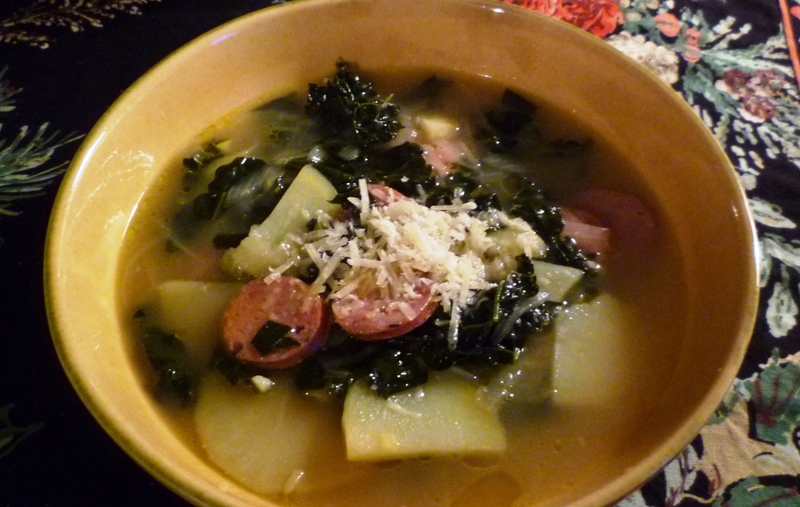 I have always made this soup pretty much as written in The Art of Simple Food. The original is nothing more than a rich, sweet onion and garlic scented chicken broth filled with potatoes and curly kale. But as always, the apparent simplicity is deceptive. I still remember the first time I made the soup. I was feeling a bit under the weather on a cold and dreary winter day and the soup tasted so very good. 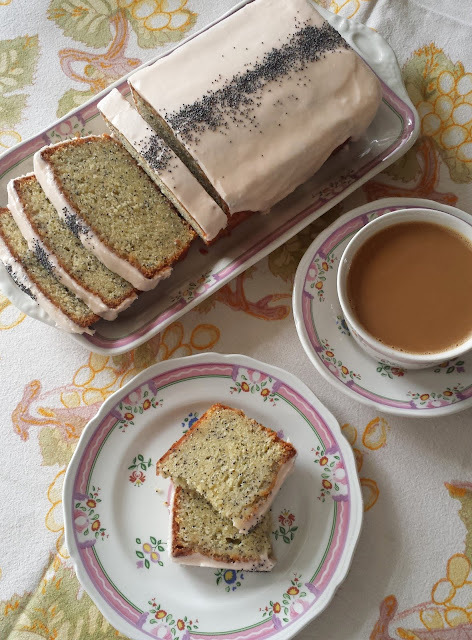 More than that though, as I ate, it made me feel truly nourished... I remember just wanting to bury my face in the bowl. I didn't, of course....but it really was that good. I made it for the first time a few weeks ago with her optional addition of sausage. 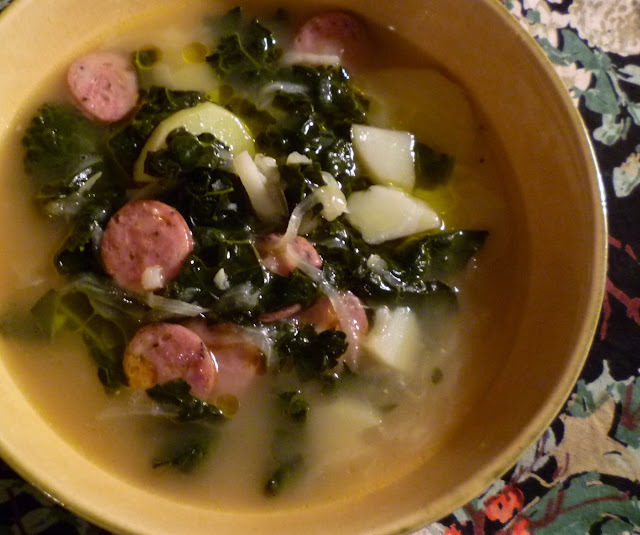 At the time, I think my goal was just to make the soup a bit more substantial....and I happened to have some of the Aidells sausage on hand. I was surprised by how delighted I was with the result—I really didn't think the soup could be any better. Clearly I was wrong. I imagine I'll make it again someday without the addition of the sausage, but for the foreseeable future...probably not. In a heavy soup pot set over medium heat, warm a thin film of the olive oil. Add the sausage and brown. Lift out and add the remaining olive oil. Add the onions and cook, stirring occasionally, until soft, tender, and slightly browned—about 12 to 15 minutes. 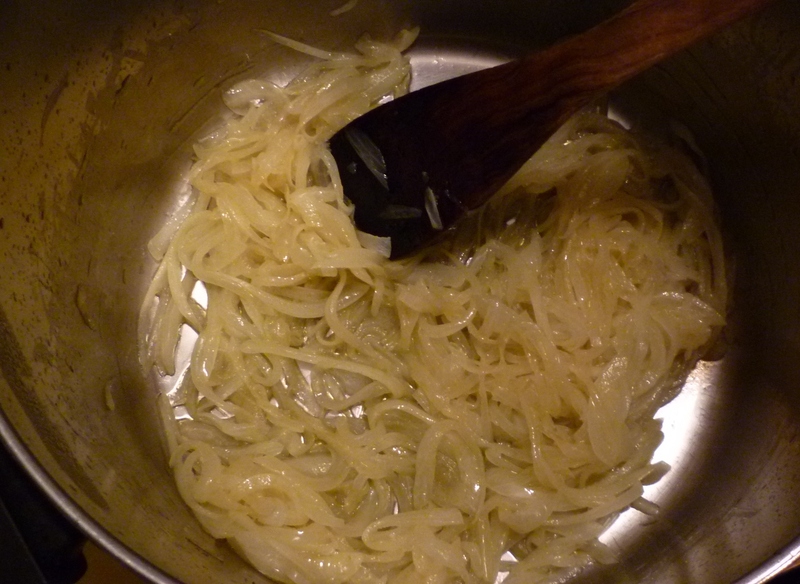 Add the garlic and continue to cook until fragrant—1 or 2 minutes. Add the kale along with a generous pinch of salt and using a tongs, turn to coat. Cover and cook over low heat for 10 minutes—the kale will collapse and will begin to soften. Uncover and add the potatoes along with another pinch of salt. Cook, stirring occasionally, for 2 or 3 minutes (so that the potatoes will begin to give up some starch). Pour in the stock. Raise the heat, bring to a boil, then immediately reduce the heat to a simmer and cook for 30 minutes, or until the kale and potatoes are tender. 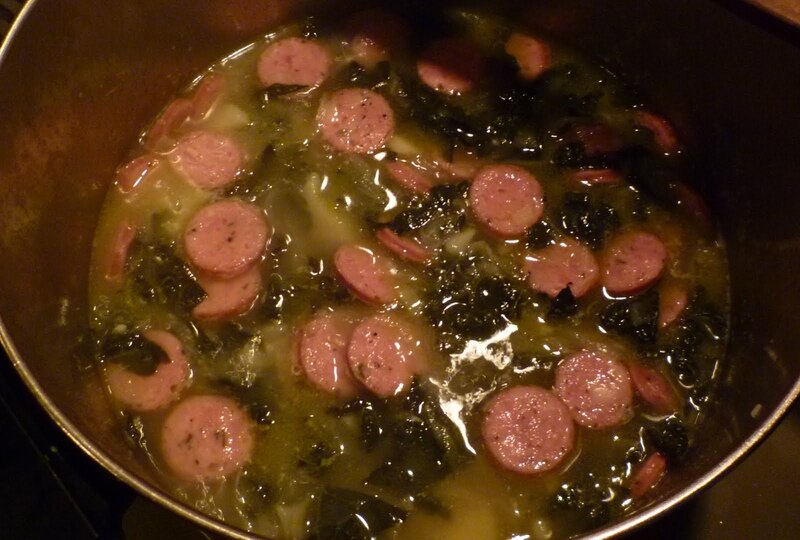 While the soup simmers, slice the sausage in 1/4-inch thick rounds. Add to the soup for the last ten minutes of cooking. Taste the soup and add more salt if necessary. Serve hot and garnish each serving with a drizzle of olive oil and a sprinkling of cheese. Waters' original version did not include sausage. You may leave it out and just begin by cooking the onions in all of the oil. You may use any variety of kale that you prefer. Waters' original recipe was for curly kale. I prefer Tuscan. Add 1 1/2 cups cooked white beans with the sausage for a more substantial soup. If using canned, rinse them before adding. If freshly cooked, add them with their cooking liquid. If using canned, you may need to add more broth or water.